You need design Cylinder Venn Diagram? Nothing could be easier with ConceptDraw DIAGRAM diagramming and vector drawing software extended with Venn Diagrams Solution from the “Diagrams” Area. ConceptDraw DIAGRAM allows you to design various Venn Diagrams including Cylinder Venn Diagrams. Large set of templates and samples that you can use as the base designing your own Venn Diagrams. Use ConceptDraw STORE to get quickly the access to the Venn Diagrams templates and samples. 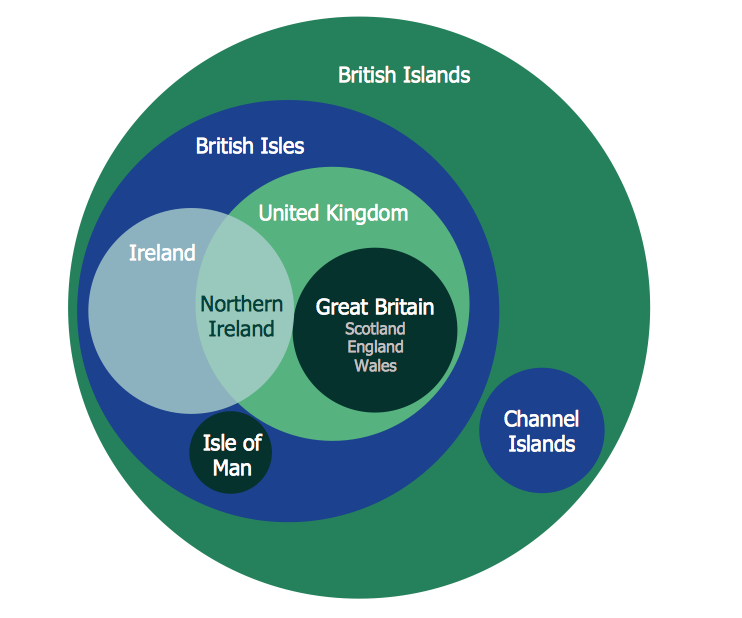 This sample was created in ConceptDraw DIAGRAM using the Venn Diagrams Solution from the “Diagrams” Area and shows the British Islands Venn Diagram. An experienced user spent 5 minutes creating this sample. Use the Venn Diagrams Solution for ConceptDraw DIAGRAM to create your own Cylinder Venn Diagrams of any complexity quick, easy and effective. The Venn Diagrams designed with ConceptDraw DIAGRAM are vector graphic documents and are available for reviewing, modifying, converting to a variety of formats (image, HTML, PDF file, MS PowerPoint Presentation, Adobe Flash or MS Visio), printing and send via e-mail in one moment. As concept map consists from conception-blocks and links between them, you can use ConceptDraw library objects and add to a document as much objects as you need. ConceptDraw tools let you to edit, group, move objects, change their appearance and add text signs and raster or vector pictures. ConceptDraw DIAGRAM v12 diagramming and vector drawing software extended with Concept Maps Solution from the "What is a Diagram" Area is effective tool for creating professional looking Concept Maps.